There are traditions at Christmas - like chasing Brussels sprouts around your plate, telling terrible cracker jokes and watching Charlie Brooker ride roughshod over the previous year. The programme usually sees him cast a satirical side eye over the main events of the previous 12 months. But he's now said there will be no 2017 Wipe, as he ran out of time. The writer and presenter has also been working on a new series of his award-winning drama Black Mirror. Brooker announced the news on Twitter, saying: "Was set to do it, but ran out of road". It's disappointed many fans who'd been looking forward to his take on 2017's news stories. Those could have included Donald Trump's inauguration, the general election, terrorist attacks including those in Manchester and London Bridge, the Grenfell Tower fire, the row between the US and North Korea, and Prince Harry's engagement. He said he was behind on scripts and development, discovering belatedly that he "can't do 400 things at once". One fan tweeted that the news from Brooker was "such a 2017 thing to happen". And actor Sanjeev Bhaskar wrote: "In that case there was no 2017 as far as I'm concerned." Another said it meant "Christmas is cancelled". When someone replied, saying it had been a "slow news year anyway", Brooker replied that when his annual Wipe started in 2010, "pretty much the biggest story that year was Cat Bin Lady". Brooker added that "the good news" was that Cunk on Britain, a five-part series starring the fictional Philomena Cunk (played by Motherland's Diane Morgan), was coming "soon". He's written the series. 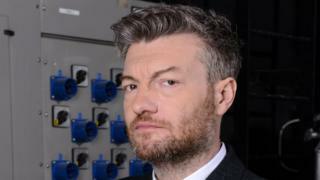 A BBC spokesman said: "Due to other commitments Charlie Brooker has decided to take a year off from his annual Wipe. "Fans won't have to wait too long however for more from Charlie, as Cunk on Britain will be coming to BBC Two in early 2018."